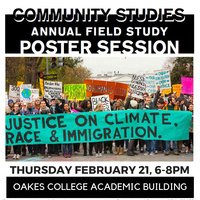 Community Studies proudly presents its annual poster session created by students just back from their six-month full time field studies working with social justice organizations from Japan to Santa Cruz. Come talk with them about their experiences working for, learning about, and analyzing the prospects for social change. For accommodations or questions please contact Veronica Lopez-Duran at vlopez1@ucsc.edu or 841-459-2371.